"“I feel like a lot of NA teams lose the psychological battle." Jordan ‘n0thing’ Gilbert has competed for Cloud9 since 2014. He is known for his positive attitude and, of course, the flashbang dance. Often reserved and camera-shy, professional gamers can make for unconventional interviewees. Cloud9’s outspoken and cheerful Jordan ‘n0thing’ Gilbert is the antithesis of this. Backstage at the ECS Finals in London it’s clear Jordan is a man who everyone knows, and who knows everyone, stopping regularly to chat or break a joke with players, casters and crew. After their victory over the Danish Astralis, Jordan sat down to share his views on North American CS and the weight of competing for his nation’s hearts. Despite his youthful exuberance, Jordan is actually one of the most experienced faces in the North American scene, and as captain of Cloud9 he faces a lot of pressure for the team to perform. The rise of Luminosity Gaming has rocked the American scene, and while C9 no longer hold the top spot, they see LG’s story as an inspiration. With the likes of Team Liquid, Counter Logic Gaming and TeamSoloMid all vying for attention, NA CS has entered one of it’s most contested periods, making for exciting viewing. 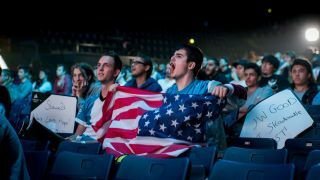 American audiences dominate online, comprising a huge portion of discussion on sites such as HLTV and the Global Offensive subreddit. While this gives NA teams an enormous support base, it also presents a onus for success many players struggle to handle. The ever-present divide between North American and European CS—the former often struggling to compete in spite of a vast player spectrum and monetary support—has dogged the NA scene for years. American fans expect victory, so when things aren’t going well, playing for one of your country’s top hopes can be grueling. Far from being limited to Cloud9, the internet is rife with mockeries of North American failure. While the great majority is in good humour, there is also a significant amount of aggression. The contrast between streaming and competition performances isn’t an easy thing to convey to viewers, particularly those younger or new to the game. When individuals draw huge streaming audiences, it becomes very easy to disappoint on the stage. The semi-anonymity and speed of services like Twitter can lead to a real disconnect in people’s attitudes compared to face-to-face interaction. Online abuse is in no-way unique to esports, but it remains an enormous issue in the competitively-minded landscape. The problem clearly frustrates Jordan, especially without an easy solution in sight. Nevertheless, with more outspoken and respectful players as role models, there is always the chance the community will evolve. “I hope people will start to take more seriously what they’re saying,” Jordan says. “Even you and your friends can get confused texting each other, let alone a stranger. How do you expect people to not misconstrue things [online]? I just think people should start to be more respectful and thoughtful with the way we speak on the internet.” As Counter-Strike’s audience continues to grow, It’s a lesson many could stand to learn from.